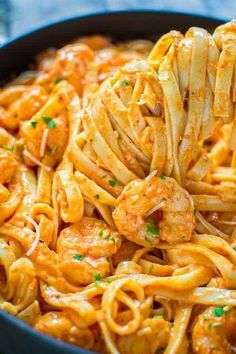 Rich and creamy, hearty and so flavorful, this Shrimp Fettuccine with Roasted Pepper Sauce tastes better than a restaurant-cooked meal. Made in under 30 minutes! Bring a large pot of water to a boil and cook the fettuccine according to the package instructions. Drain, rinse with cold water, and set aside. Meanwhile, place the roasted peppers together with the liquid from the jar into a food processor or bullet blender and puree until smooth. Heat up a large, non-stick pan. Add butter, shrimp, paprika, and red pepper flakes and cook for 3-4 minutes on high heat. Add salt and garlic, and cook for 1 more minute.